Pairing your songs with political messages can lead to dangerous territory. Some people, who would otherwise like your music, may ignore your records due to the lyrical content. Others may, as in the case of Green Day’s 2004 album American Idiot, criticize you for being pompous or preachy. For politics to successfully mix with music, the songwriters need to find a mix that was most famously perfected by musical legends the Clash and Bob Marley: You must come off as authentically concerned about what you’re writing about, and the tunes must be good. Michael Franti and Spearhead understand this completely and, thanks to years of experience on the road and around the world, have attracted a sizeable fan base due to their socially conscious take on jam band reggae-pop. Franti did not start off as a member of the jam rock set. In fact, the Bay Area native came to local prominence as a member of The Beatnigs, an industrial punk band signed to Dead Kennedys frontman Jello Biafra’s label, Alternative Tentacles. The band would signal the start of Franti’s musical and political exploits, with songs about the evils of television and featuring the use of rotary saws and other power tools to create industrial rackets. Franti’s next group was an avant-garde industrial hip-hop group known as The Disposable Heroes of Hiphroprisy, which paired the social awareness of A Tribe Called Quest with a sonic palette that was less jazz and more punk. The Heroes’s debut album, Hypocrisy is the Greatest Luxury, is widely lauded for its industrial soundscapes and topical lyrics, dealing with such topics as homophobia, racial equality and, naturally, hypocrisy. It’s even included in the music reference book 1001 Albums to Hear Before You Die, a particular success given that, at the time, it was overshadowed by the emerging G-Funk sound. The band was even selected to open for fellow politically-minded musicians U2, which is, frankly, a pretty big deal. 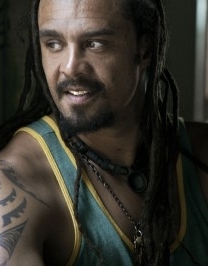 Following the dissolution of The Disposable Heroes, Franti founded Spearhead, his most successful project to date. The bands combination of reggae, hip hop and funk has, along with their (mostly leftist) political messages earned them legions of fans, especially on college campuses. Not only does he bring the jams (from incendiary reggae jams like “Yell Fire” to the ubiquitous, sunny pop hit “Say Hey (I Love You)”), he’s got the experience to back up his political rhetoric. He’s traveled throughout the Middle East, vocally opposed the Iraq War (before it was cool), played at Obama rallies and appeared at peace demonstrations big and small throughout the country.